This project is a critique on our cultural attitudes and how we determine them. A critique on what we consider to be of heritage significance and how this may be narrated in a contemporary manner. We challenge the idea that small inner city blocks cannot respond to complex contextual constraints such as orientation, sustainability, planning controls on urban infill and heritage restrictions. Instead of negotiating with these so-called ‘constraints’, we utilised them as areas of possibility and exploration for our design processes and discourse. The once vacant site consists of two opposing street frontages – Wilson Street to the south and Gold Street to the north. The two streetscapes are contextually opposite, a juxtaposition that informed our design response and building typology for the two dwellings. While Wilson Street boasts the ornate frontages of a series of Victorian terraces, the Gold Street interface consists of the leftover spaces, garages and ad hoc lean-tos at their rear. The scheme celebrates and seeks to retain the existing historical character of the two streetscapes without attempting to literally replicate the Victorian terrace typology, but reinterprets and critiques this condition through a contemporary architectural language. Our strategy was to break down the elements of the terrace house, and to critique and respond to its inability to address solar orientation, its poor linear program, and the lack of natural light and ventilation. The Perforated House retains the idea and the symbolism of the terrace, but elevates the gesture to an ironic or even satirical level to engage in a public debate. 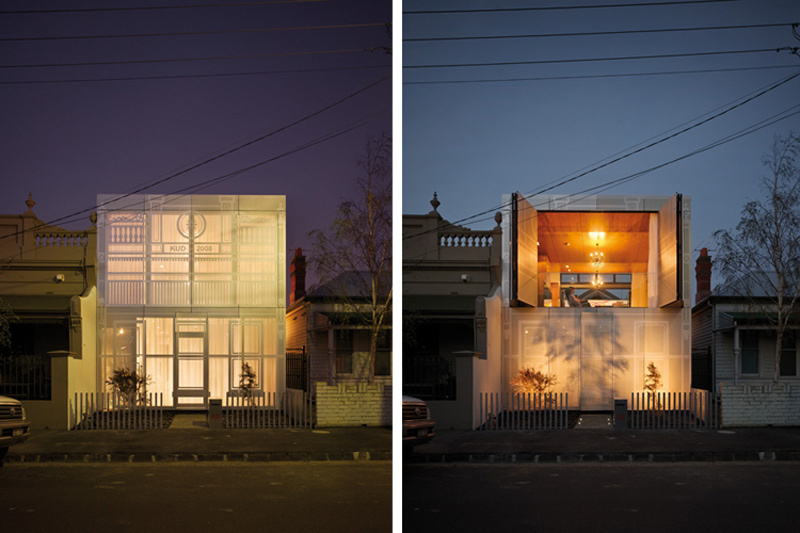 We wanted the house to be more than just a façade. Our building was not an urban canvas paying tribute to Venturi’s ‘decorated shed’; instead the external façade could be experienced internally and is also a multifunctional device that constantly transforms the built form from solid to void, from private to public, from opaque to translucent. Formally, the two houses are similar in plan, but differ in section. The development’s built form has been designed as one continuous mass. A large negative space that serves as a centralised terrace for the Perforated House offers a north-facing terrace to the problem of a south-facing block. 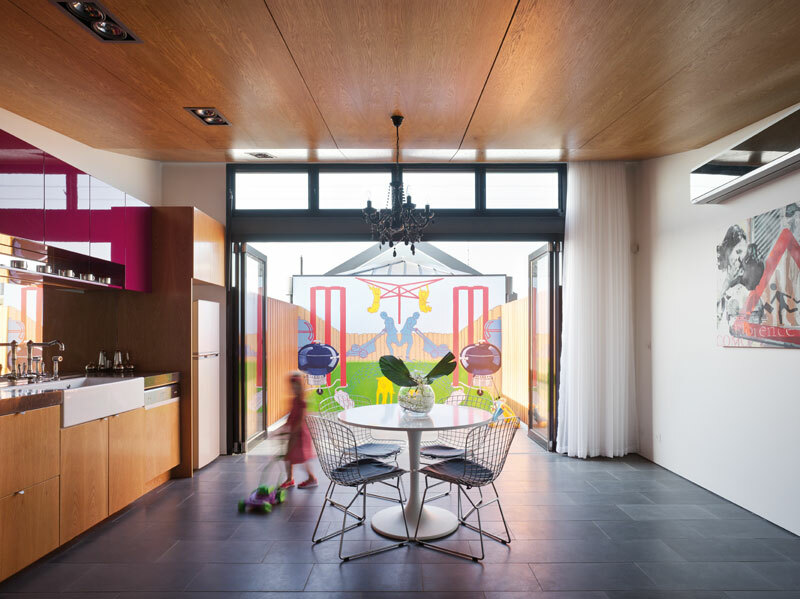 The external open space redefines the ‘Aussie’ backyard reinforced by the childlike mural reminiscing on a past era and making commentary on the changing demography of the family unit and ultimately the inner city house typology. Kavellaris Urban Design (KUD) are the new kids on the block, and their design for two townhouses in Brunswick is a fresh take on the terrace house type within a contemporary Australian context. Sitting back-to-back on a tiny 5.5-metre by 28.9-metre site, the townhouses read as a singular building – an interpretation of the terrace house typology with lean-to extension. Engaging with the existing streetscape, the Perforated House, Billy Kavellaris’ own house, faces onto Wilson Street and completes the set of adjacent Victorian terraces with its printed terrace house façade. The rear townhouse faces onto Gold Street and takes on a lean-to typology with its lightweight metal cladding echoing the back lane feel of the street. Despite the tight fit, both houses are cleverly planned, well oriented and a good shot at tackling the terrace house typology. The Perforated House façade opens up to Wilson Street like a dollhouse, with its three-skinned bi-folding façade creating an active and changeable frontage. 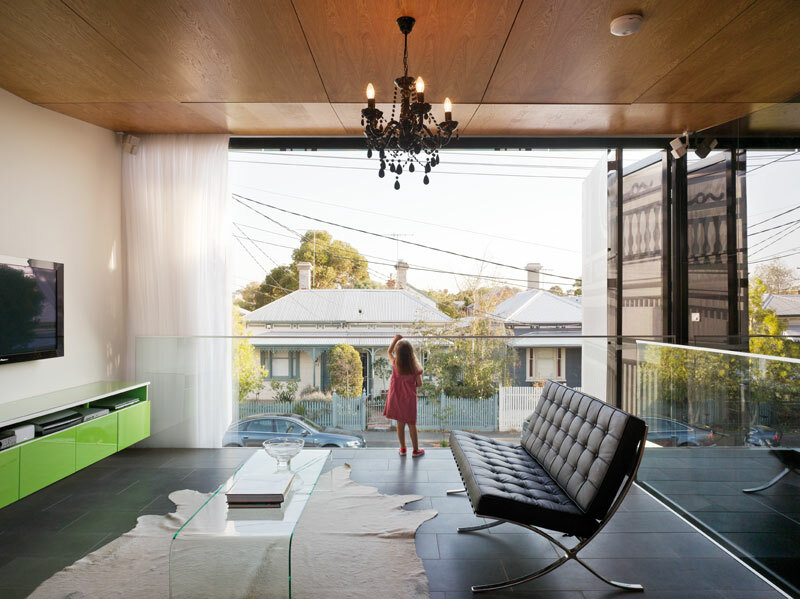 Comprised of a glazed wall sandwiched between a three millimetre perforated anodised aluminium screen facing outside and a sheer curtain facing inside, it is a clever system which cross ventilates the space and also allows for different levels of privacy and light. The screen is offset at a varying distance along the façade. This casts a shadow back onto the glazing, providing privacy during the day. At night, the façade can either be exposed to the neighbourhood via internal lighting, creating a lantern effect, or kept private through external floodlighting, which throws shadows onto its surface. 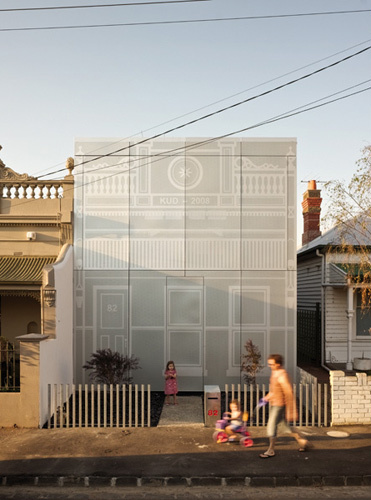 Printed on the perforated screen is an image of a Victorian terrace house (complete with ‘KUD 2008’ on the ‘parapet’, in true terrace style fashion), creating both a bookend to the adjacent terrace house set and branding for the practice – a billboard for KUD. There is a deliberate disjuncture between this façade image and the function of the façade proper, and when I met Kavellaris on site I was momentarily confused as to where the front door actually was. Irony along with a poke at council regulations is no doubt in play here. At face value, this project could be seen as part of the recent lineage of big image façade houses in Melbourne – namely Cassandra Complex’s Newman House and Jackson Clements Burrows’ Tyson Street Residence. It is slicker and less pop than the Newman House, however, and while its approach to the constraints of heritage and streetscape are somewhat analogous to Tyson Street’s, KUD’s play with heritage extends beyond the façade. References to classical elements, though not strictly drawn from the terrace house type, can also be found inside the Perforated House – a traditional timber panelled door is printed on the glass ensuite door, chandeliers line the living room ceiling along with a classic Shaw kitchen sink and taps, which adds a quirky touch to the tasteful interior. As Kavellaris describes, “evoking a sense of history and memory for the past” was an important aspect of the design. The Gold Street façade attempts to take on the language of the rear lane, but is better dressed than its neighbours. 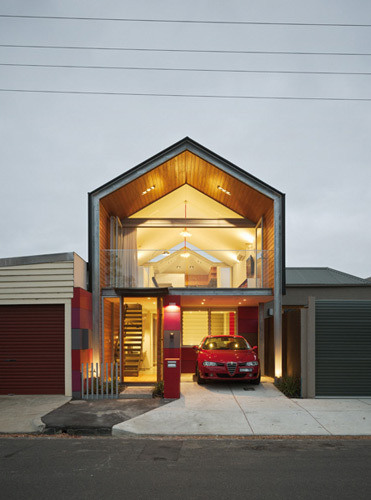 Its expressed portal framed structure, timber lined soffit and brightly coloured cladding lacks the irony of the Perforated House but does add a sparkle to this otherwise neglected streetscape. 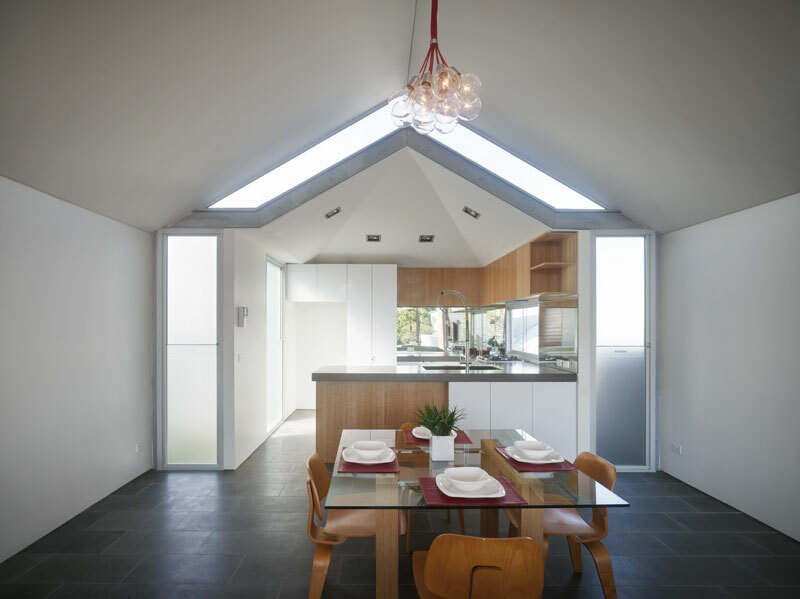 The townhouse duo also questions the terrace house type through internal planning. Kavellaris identified a number of problems with the type: “They are not an Australian model, don’t take orientation into account and are badly planned with long linear corridors that lead you out to the back.” Rejecting this model, both houses adopt an upside down plan with public zones upstairs and private downstairs. This maximized availability of ground level floor space while also opening the upper level living rooms, both of which face onto terraces, to more northern light. In line with the upside down model, these upper level outdoor areas are a tongue-in-cheek interpretation of the Aussie backyard. This is particularly true of the Perforated House, the terrace for which boasts a child-like mural of a backyard scene complete with Hills Hoist and BBQ, painted by young artist Emma Burmeister. Both houses are tightly packed but maintain a spacious feel throughout. As Kavellaris says, “The idea is that small spaces can be compartmentalised but also opened up.” Every leftover space gets used for things like storage, laundry and study areas and bathrooms are co-shared. Mirrors and reflective surfaces are also strategically used to bounce light into dark areas and create the illusion of more space. The KUD branding continues inside where the practice colours of red, black and white are featured throughout. These bold colours are combined with raw materials like polished concrete, bluestone and American oak timber, creating an effect that can be austere in places, but which is softened by views and access to outside landscaping. Architects’ own homes are often used as testing grounds for ideas, but these Brunswick townhouses are more like a showcase for KUD. Bearing the practice’s name on the façade, along with the practice colours throughout, they seem to be like a built manifesto. If so, it offers a pleasing glimpse into a possible future trajectory for this emerging Melbourne newcomer. Christine Phillips is a lecturer in architecture at RMIT, co-host of The Architects on Melbourne RRR and a director of OpenHAUS.